Famous for having made the flying sandals for Hermes, the sandal maker also embellished them with his personal signature… a “golden wing” buckle…….. Chic up your feet in the elegant Evia Sandals by Ancient Greek Sandals. With decadent bronze, silver and gold metal rings, these leather sandals have a two strap thong and round toe. Bring the fun of summer to your feet with the Thais Rainbow Sandals in Platinum by Ancient Greek Sandals. In high gloss leather with a tonal oversized winged buckle, these are a playful take on a bestselling sandal. Update your holiday wardrobe with the stylish Apteros Sandals in Navy Satin from designer Ancient Greek Sandals. These classic slides in a cut out H silhouette are made from the softest metallic satin, and have a small heel and leather round toe sole. Update your holiday wardrobe with the stylish Thais Sandals in White from designer Ancient Greek Sandals. 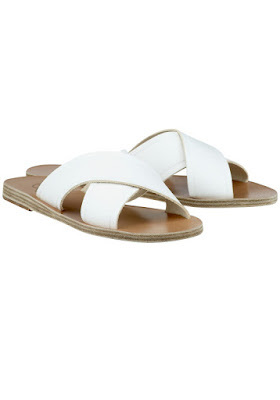 With a super soft white leather cross over upper, they have a small heel and leather round toe sole, the perfect wear everywhere sandals. Look chic in the simple and wearable Anna Sandals in Off White by Ancient Greek Sandals. 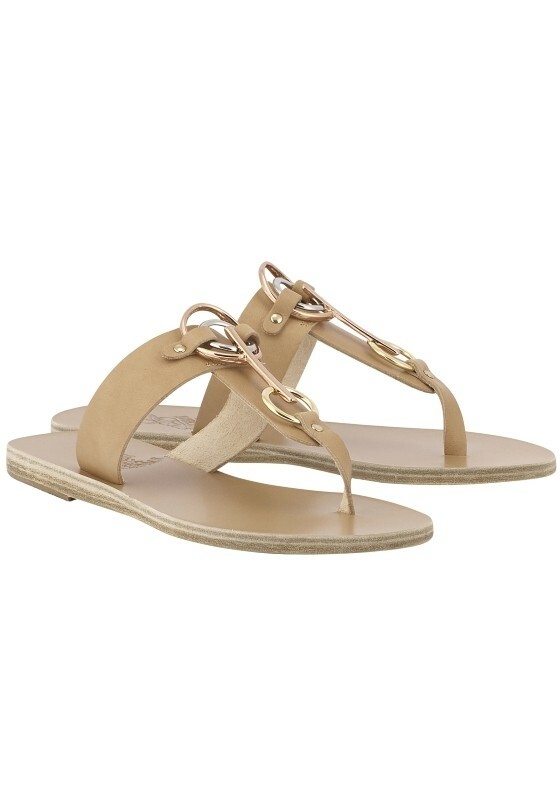 In soft off white leather, these elegant sandals feature v shaped cut outs on each side with the signature gold winged buckle across the centre. 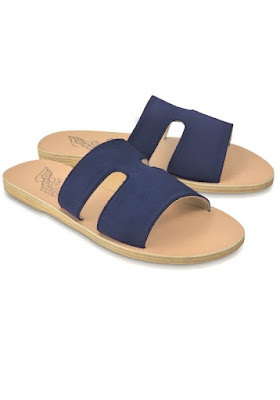 Make a style statement in the Taygete Slides in Crosta Deep Blue from designer Ancient Greek Sandals. 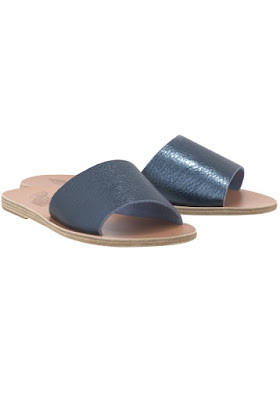 These glamorous sandals in deep blue metallic leather have a small heel and leather round toe sole. Wear them with everything from denim shorts to dresses.